Baby bath time is our most favorite time of day. 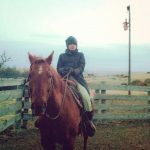 It is one of the many bonding moments I share with my little ones. It’s part of their bedtime routine as well. It just helps them sleep better at night. Just to warn you though, not all babies love bath time. Your baby might squirm and scream at first, but soon he will love it too with the right products and technique. On that note, let’s talk about my baby bath time essentials. No fluff, just the important stuff. This page may contain affiliate links. In the event of a sale, I may receive a small commission at no extra cost to you. Read my full disclosure policy for more information. You can find an inexpensive yet durable baby bath tub from your friendly neighborhood department store. However, I recommend that you get the best baby bath tub to last the whole year until your baby is ready for the real one. Most importantly, a good quality baby bath tub can help ensure your baby’s safety. I recommend this baby bath tub from Fisher-Price. 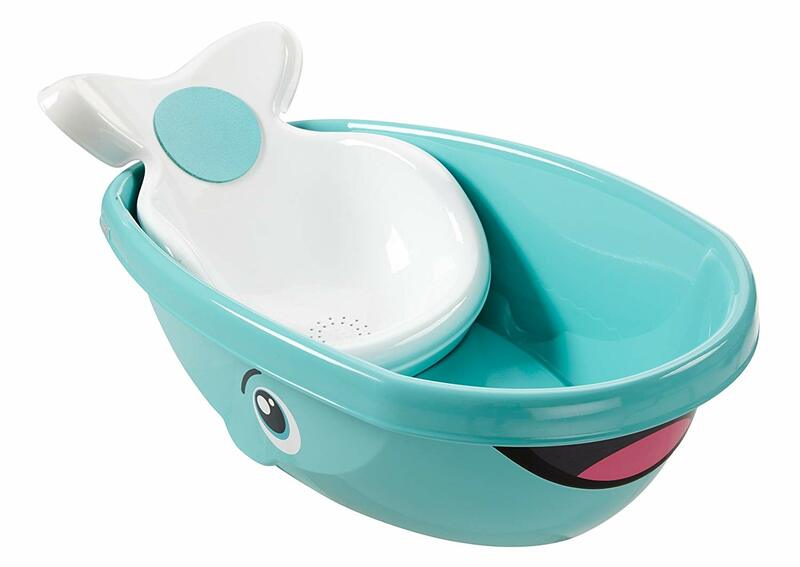 I am a big Fisher-Price fan and both my kids used the older blue whale baby bath tub when they were still very little. This is a newer version of it. Be careful in choosing a body wash and a shampoo for your baby. Make sure that they feature a gentle formula that won’t easily dry your baby’s delicate skin. I strongly recommend these baby bath toiletries. 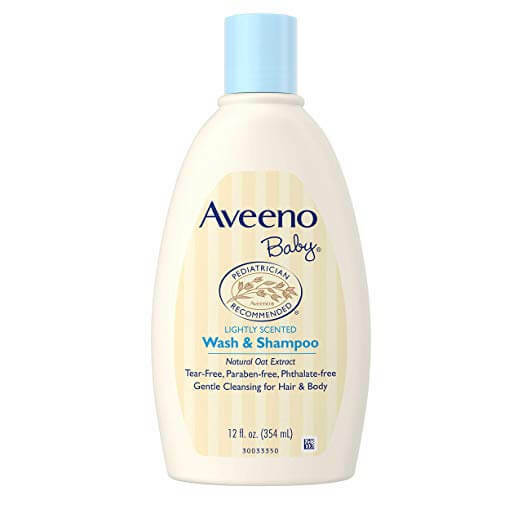 Both my kids are still using Aveeno baby bath time products up to this very moment. Are you familiar with the cradle cap? A cradle cap is a common and harmless condition that affects newborn babies. Rough, scaly patches will appear on your baby’s head for no known reason at all. To prevent cradle cap (or treat it), you are advised to gently scrub your baby’s scalp with a soft-bristled brush and a mild shampoo. As a mom, you think of ways to make everything easier for you without jeopardizing the safety of your baby. 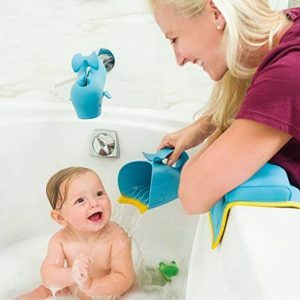 This rinsing cup from Skip Hop is great for giving your baby a bath. It is designed to keep water out of your baby’s eyes and ears. It also has a soft lip that cushions your baby’s forehead. Truly safe so you can be comfortable all through baby bath time. 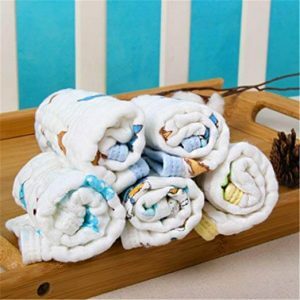 When purchasing washcloths, always look for something that is gentle on your baby’s skin yet super absorbent. 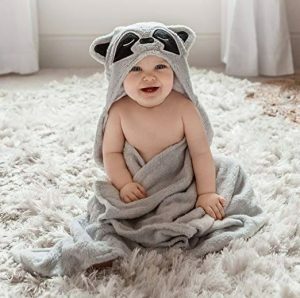 Washcloths made out of thin and soft materials are the way to go as they can provide your baby a comfortable bath time experience. 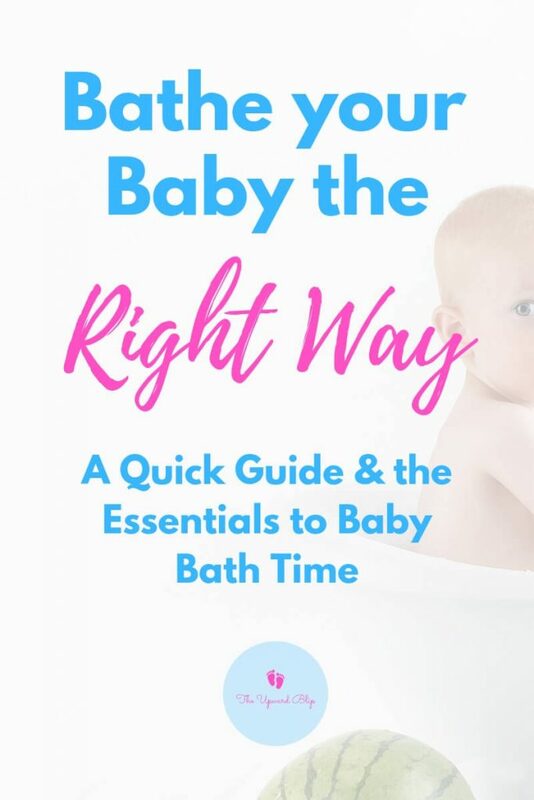 How to give your baby a bath? Reminder: Always protect your baby’s head and neck. Make sure the room’s temperature is around 75-degree Fahrenheit as baby gets cold easily. Carefully slip your baby’s feet into the tub, gradually putting his whole body to the warm water so he won’t be surprised. Gently pour cupfuls of warm water on to his body frequently so he won’t get cold. Squirt a little baby shampoo or body wash to the soft washcloth and wash him from head to toe, front to back. 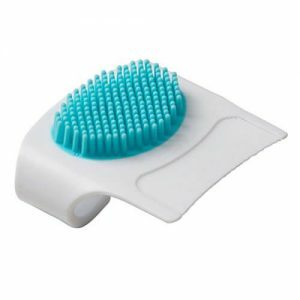 Softly scrub his scalp with a massaging brush to prevent cradle cap (or treat it). Rinse the washcloth thoroughly and use it to wipe his eyes from the inside corners to the outside corners very gently. Rinse your baby thoroughly with cupfuls of warm water. Lift him swiftly out of his tub. Wrap him very carefully with a hooded towel and pat him dry. Put his diaper on and dress him in fresh, warm clothes. Baby’s skin is more prone to lose moisture more quickly than the adult skin. If you wish, you can apply a dab of baby lotion after your baby’s bath to prevent skin dryness. It is not recommended to give your baby a bath every day unless he starts crawling and gets himself in a mess. Every baby is different. Not everyone will have an instant fondness to bath time in general. Keep doing it to establish a routine though. Babies love routine. Routine provides them comfort. Thank you for reading! Don’t forget to share it with your friends. Are you a mom-to-be? Check out the ultimate “Prep-for-Baby” kit and download while you’re at it! You won’t be disappointed. Let me help you prepare for your new baby’s arrival. Get the free prep-for-baby kit now! Note: You will get our monthly-ish newsletter too. We will never send you spam. The Kit is all yours! Join our mailing list and get your monthly-ish dose of mom tips and more! Thank you for stopping by, Sheqo! I love the waterfall bath rinser too. If you are scared getting water to your baby’s ears during baby bath time, you really have to invest in those. Great group of products! Very informative! Thank you, Michele! I gave it my best to share something so informative with the first time moms. Baby bath time is one of the most intimidating of all. It’s been a long time since we had baby bath time in our home. It was always a slow down time, time to connect and talk. We told stories to our babies, talked to them, they looked to us with great attention. Awwww! You’re right about that, Blair. Baby bath time is really one of those many bonding moments we share with my babies. They love the water a lot! Not to mention, it helps them sleep better at night too. Thank you so much for reading it, Jennifer! The whale of a tub is definitely my favorite! The Aveeno calming comfort bath comes to a close second. Both make my babies’ bath time all the more awesome! this is such good info, when i have a baby ill be reading this :)!! Lol! Awwww… I really appreciate it, Kathleen! 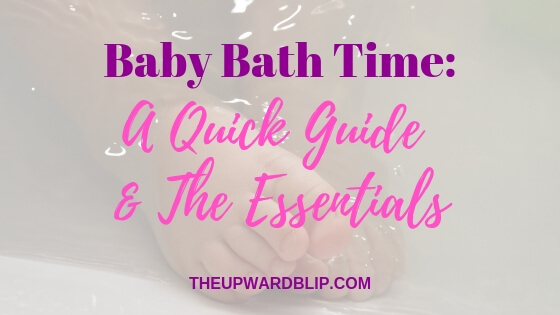 This baby bath time guide will be great for you in the future.